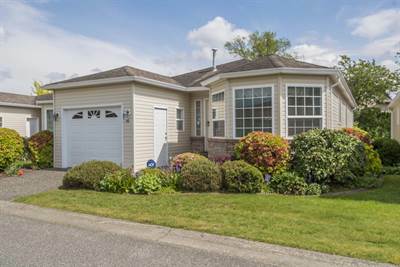 Perfect Retirement Rancher in Central Chilliwack Location! • 2662 sqft , 3 bath , 3 bdrm townhouse “with full walk-out basement” – FOR SALE CAD409,000 . New Price! Wow! Spacious Detached Home in Cottage Grove! Fully finished Walk-out Basement, Vaulted Ceilings, separate Dining Room and Eating Nook. Master Suite on main floor with Large walk-in and Ensuite. Upper level includes 2nd Bedroom or den, and Laundry room. Lower level with a bedroom, bath and family room, large enough for big family gatherings. Bare-land strata with only $100 monthly fee. Enjoy your morning coffee over looking the peaceful brook from your patio. Beautiful landscaping, small garden plot, well cared for home! Wonderful Gated 55+ community. Come and view today! Perfect 3 bedroom Rancher on Large Lot in Great Sardis Location! • 1481 sqft , 2 bath , 3 bdrm single story “Rancher on large lot!” – FOR SALE CAD624,900 . Downsizing? Growing your Family? Perfect 3 bedroom 2 bath Rancher for growing families or the person wanting to downsize! 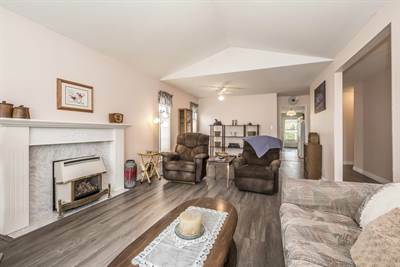 Vaulted ceilings, large updated country style kitchen and dining area overlooking backyard, patio and mountain views. This eating area could be easily made back into family room for families. Gorgeous new flooring, brand new hot water tank and central air, recently installed. Large patio, partly covered for entertaining ease. Private gated yard with fabulous walking trail close by. Man alert! Double garage, 2 sheds, one is wired, and lots of parking, room for all your toys, RV, boats , quads. etc! This is a great location, not a through street, and walk to shopping, restaurants and quick freeway access! Call to book your appointment to view today! Beautiful Luxury Home with Fantastic River Views! • 3108 sqft , 3 bath , 3 bdrm 3 story – FOR SALE CAD658,000 . Move-in Ready! Retriever Ridge Home! Featuring the Best River views up the Fraser Valley. Over 3000 sq ft Luxury Home featuring granite counter tops, outstanding finishing, gleaming hardwood floors, spacious kitchen and dining room and gorgeous rock fireplace in living room. Also you have walk-in pantry, heated floor in ensuite, large walk-in closets, a fabulous loft, perfect for an at home office where you can enjoy the breathtaking views, Media room and other bedroom on lower level. One of the few homes with a beautiful landscaped private backyard. Take in the views from your covered patio on main floor, living room windows or loft! Two car garage and visitor parking. What’s not to love? View today! • 3108 sqft , 3 bath , 3 bdrm 3 story – FOR SALE CAD658,000 . Retriever Ridge Home! Featuring the Best River views up the Fraser Valley. 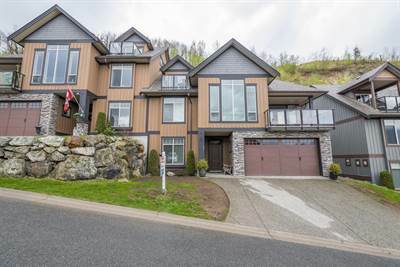 Over 3000 sq ft luxury home featuring outstanding finishing, gleaming hardwood floors, spacious kitchen and dining room and gorgeous rock fireplace in living room. Also you have walk-in pantry, granite counter tops, heated floor in ensuite, large walk-in closets, a fabulous loft, perfect for an at home office where you can enjoy the breathtaking views, Media room and other bedroom on lower level. One of the few homes with a beautiful landscaped private backyard. Take in the views from your covered patio on main floor, living room windows or loft! Two car garage and visitor parking. What’s not to love? View today! in Chilliwack Airport, Chilliwack Announcing a price drop on 14-8500 Young Road, a 2662 sqft , 3 bath , 3 bdrm townhouse “with full walk-out basement”. Now FOR SALE CAD409,000 . New Price! Invest or Run your business from this great Commercial Space! • 2500 sqft , 1 bath commercial – FOR SALE CAD589,000 . New Price! 2500 sq feet plus mezzanine storage in a great Chilliwack location. This is a 1/2 duplex strata with a fee of only $200 per month covering insurance and contingency. Owner/tenant in place. Environmental study and passed to bank’s satisfaction. Side bay with 12 ft roll up door. Minutes from freeway, great location for your business or investment opportunity. 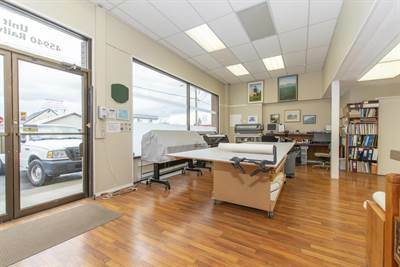 in Central Chilliwack, Chilliwack Announcing a price drop on 1-45940 Railway Ave, a 2500 sqft , 1 bath commercial. Now FOR SALE CAD589,000 . New Price!